We read and hear quite a lot about rigor on the STAAR Mathematics test. In the past few years the State of Texas has been trying to up the ante in students’ conceptual understanding of mathematics. Let’s try to break down what rigor may mean. In 2013, Linda M. Gojak, Past President of the National Council of Teachers of Mathematics, was discussing rigor with a group of mathematics coaches from around the country. The coaches commented that many of their teachers were confused by exactly what was meant by teaching and learning with rigor and they were unsure about how to respond. Together they began exploring the notion of rigor with an online search of the word “rigor.” The thesaurus led to a list of synonyms, including “affliction,” “inflexibility,” “difficulty,” “severity,” “rigidity,” “suffering,” and “traditionalism”—none of which describe characteristics of rigorous mathematics instruction. No wonder there was confusion! However, two additional words included in the list—“thoroughness” and “tenacity”—provided avenues for some serious thought about what “rigor” implies. Without a common understanding of the meaning of the word rigor, how can teachers provide rigor in the classroom? Take this quick true/false quiz. _____ If standards are rigorous, the course is automatically rigorous. _____ Rigor means using creative ways to solve relevant problems. _____ Rigor means more work. _____ Rigorous work should be more difficult. _____ Rigor means selecting highly rigorous content. _____ Rigorous instruction allows time and opportunity for students to develop and apply their understanding. _____ Younger students cannot engage in rigorous instruction. _____ In order to engage in rigor, students must first master the basics. Rigor isn’t as much about the standards as it is about how you ask students to reach the standards. There are times when students are asked to achieve highly rigorous standards in un-rigorous ways. At other times, teachers are able to take mediocre standards and help students achieve highly rigorous learning by designing rigorous learning experiences that correspond with those standards. Therefore, statement one above is false. While rigorous instruction may require that students put forth more effort, it is not based on the volume of work students complete. Rigor is about the quality of the work students are asked to do, not the quantity. More assignments or more reading does not guarantee more rigor. In fact, rigorous classrooms often have fewer assignments and less homework. Therefore, statement three is false. Rigorous classrooms do present more challenge to students but there is a difference between challenge and difficulty. Challenging work requires students to stretch and reach for new understanding. Work can be difficult for a variety of reasons. Examples include unclear instructions, a lack of necessary resources or adequate support, and demands that are too great for the time allotted. We can all think of assignments we endured that were difficult without being intellectually challenging. Thus, it is a mistake to think that just because students had difficulty completing their work, they have engaged in a rigorous assignment. Therefore, statement four above is false. Selection of highly rigorous content does not guarantee a highly rigorous learning experience for students. How we ask students to engage in the content determines the level of rigor for the course. Therefore, the answer to statement five above is false. Even young students can think and interact with material in highly rigorous ways. If given the opportunity, students will naturally take what they are learning to solve challenging problems. The key is for teachers make sure that rigorous instruction is developmentally appropriate. Therefore, statement seven is false. Rigorous thinking is involved in learning even the most basic material. Students can learn the basics in highly rigorous ways. They can learn how to build adequate representations, organize those facts in some way, analyze and construct relationships among those facts, and make inferences beyond what is explicitly presented while they are mastering the basics. Therefore, statement eight is false. Rigorous instruction allows time and opportunity for students to develop and apply their understanding by using creative ways to solve relevant problems. So, if you were thinking that statements two and six were true, then give yourself a pat on the back! Looking at the examples in the above quadrants, where do you see yourself and your classroom on this framework? Quadrant A – Relevance and rigor are both low for the student as the task has no real meaning and is fairly easy for students. Quadrant B – Relevance is high since it is associated to a real example for the student but rigor is still low. Quadrant C – Rigor may be high in this activity but relevance to real world examples is low for the student. Quadrant D – Relevance and rigor are both high for the student in this task. Here the student must understand what is being taught as well as understand how to apply knowledge to relevant situations. In conclusion, here are two scholarly definitions of rigor. By agreeing on what rigor means, educators are better able to provide and recognize rigor in the classroom in a consistent way, and this benefits all students. Strong, R., & Silver, H. (2001). Teaching what matters most: Standards and strategies for raising student achievement. Alexandria, Va.: Association for Supervision and Curriculum Development. Rigor. This word may be a topic of conversation that many of you are avoiding right now. This may be related to the curricular chaos you have experienced this year with the increased numbers of historical figures and more standards in a compacted instructional pacing. With the coming of the STAAR assessment in May, you may be more concerned with getting through the tremendous amount of information with the students rather than challenging them to think critically. In the book Best Practice: New Standards for Teaching and Learning in America’s Schools (1998), authors Daniels, Hyde, and Zemelman believe, “Complete ‘coverage’ in social studies inevitably results in superficial and unengaging teaching, like painting a room—covering plenty of square feet but only one-thousandth of an inch thick.” Moreover, they state, “Students of social studies need regular opportunities to investigate topics in depth” (p. 139). A common mistake is to equate in-depth for copious amounts of time, but this doesn’t have to be the case. A well-planned Socratic questioning session with students may do more for them than taking PowerPoint notes for half of the class period. As you search for rigor, you really have to look from within and evaluate what you are doing on a daily basis. This search should start first by reflecting upon where rigor can be found in the standards. Although this standard certainly looks like a Science student expectation, it is found in all K-12 Social Studies courses: Use a problem-solving process to identify a problem, gather information, list and consider options, consider advantages and disadvantages, choose and implement a solution, and evaluate the effectiveness of the solution. So how exactly does it translate to the classroom when you have no new resources? One recommendation is to be intentional. Look for free resources that will help to stimulate problem-solving issues to pose to your students. Just a few weeks ago I caught a 10 minute segment on PBS NEWSHOUR that led to me the website for the Center for Investigative Reporting. They are undergoing a yearlong examination of the global food supply and the world’s growing population in the series, Food for 9 Billion. World Geography students can use the audio and video segments to investigate the countries being showcased and use the website to further examine and compare world food statistics. This is a great opportunity for them to discuss the problems that will arise with global population growth. Are there solutions to these problems? If so, what could be effective solutions? This kind of problem-solving allows students to evaluate the issues on their own and make decisions based on what they read, hear, and view. To really spark interest, try connecting the in-class discussion with Hans Rosling’s 5-minute population exploration, The Joy of Stats: 200 Countries, 200 Years. Here’s another student expectation that is ubiquitous in K-12 Social Studies, but worded differently throughout the various grades: Explain the difference between primary and secondary sources and examine those sources to analyze frame of reference, historical context, and point of view. This may be one of the easiest to integrate for rigor, but is often replaced by the textbook. The argument may be, “Hey, the textbook is a secondary source.” Yes, it is, but the textbook is one of many resources that should be used in the classroom. Here’s an example of a primary and secondary source pairing that could enrich student learning in the World History classroom. I went to Horns and found that the plague had already struck there; about 300 persons died on the day of my arrival. I went to Damascus and arrived on a Thursday; the people had been fasting for three days…. The number of deaths among them had risen to 2400 a day…. Then we went to Gaza and found most of it deserted because of the number that had died…. The qadi told me that only a quarter of the 80 notaries there were left and that the number of deaths had risen to 1100 a day…. Then I went to Cairo and was told that during the plague the number of deaths rose to 21,000 a day. I found that all the shaykhs I had known were dead. May God Most High have mercy upon them! In 1350, there was a great pestilence and mortality of men in the kingdom of Scotland, and this pestilence also raged for many years before and after in various parts of the world. So great a plague has never been heard of from the beginning of the world to the present day, or been recorded in books. For this plague vented its spite so thoroughly that fully a third of the human race was killed. At God’s command, moreover, the damage was done by an extraordinary and novel form of death. Those who fell sick of a kind of gross swelling of the flesh lasted for barely two days. This sickness befell people everywhere, but especially the middling and lower classes, rarely the great. It generated such horror that children did not dare to visit their dying parents, nor parents their children, but fled for fear of contagion as if from leprosy or a serpent. The students should be reading, viewing, and examining various sources as an on-going process. Leading students through primary and secondary source analysis can open up interest and pique curiosity to people’s lives long ago. 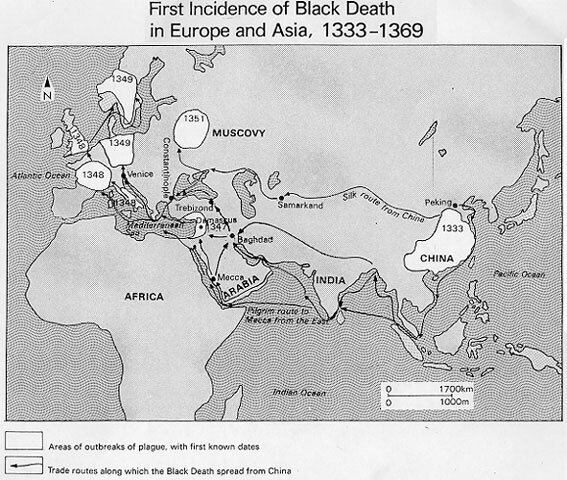 In this case, the secondary source map can be used to make ties and provide a spatial understanding of the spread of the Black Death. You can also make an ephemeral correlation to issues and pandemics today. The Center for Disease Control has a brief plague page that has simplified information on the transition and distribution of plague in our modern world. The last student expectation on rigor exploration has different verbiage at various grades, but is still present throughout Social Studies: Create written and visual material such as journal entries, reports, graphic organizers, outlines, and bibliographies based on research. For this standard, the rigor is in what the students are producing and creating. You should provide opportunities for students to research, evaluate, and reflect on the information they have learned. A concrete example is this leader report card with Napoleon Bonaparte as a model example. The assignment would be to have students evaluate Bonaparte’s leadership and impact based on the reforms made under his authority. The student research would be focused on the French leader’s time in power and overall impact. Now that you have seen a few examples of rigor in the Social Studies process skills, consider the following quote from a recently published article from Education Service Center Region 20 entitled, “How do you Identify Rigor in the Classroom?” The authors state, “Rigor is evidenced through the observation of a number of essential components of rigor: content acquisition, critical thinking, relevance, integration, application of concepts, long term retention, and student ownership of learning.” As a teacher, none of this can happen if you are not actively seeking new ways of reaching your students by pairing both content and rigor. Yes, this takes time, intentional planning, and firmly rooting yourself in your content standards, but the rigor-reward will be great. Bullis, D. MacDonald, N. (2000). The longest hajj: The journeys of Ibn Battuta, Part 3: From traveler to memoirist – China, Mali, and Home. Saudi Aramco World, 51, No. 4, Retrieved January 29, 2012 from www.saudiaramcoworld.com. Damian, L., Dykes, S., Martinez, J., Zwart, L. Final report card: Napoleon Bonaparte. Presented to R. Hernandez, HCHS. Hyde, A., Daniels, H., Zemelman, S. (1998). Best practice: New standards for teaching and learning in America’s schools. Portsmouth, NH: Heinemann. Jenkins, R., Goldhorn, J., Webb, M. How do you identify rigor in the classroom? Retrieved February 2, 2012 from http://portal.esc20.net/portal/page/portal/STAAR/Administrators. Ibeji, M. (2011). Black death. BBC: British History. Retrieved February 2, 2012 from http://www.bbc.co.uk/history/british/middle_ages/black_01.shtml.